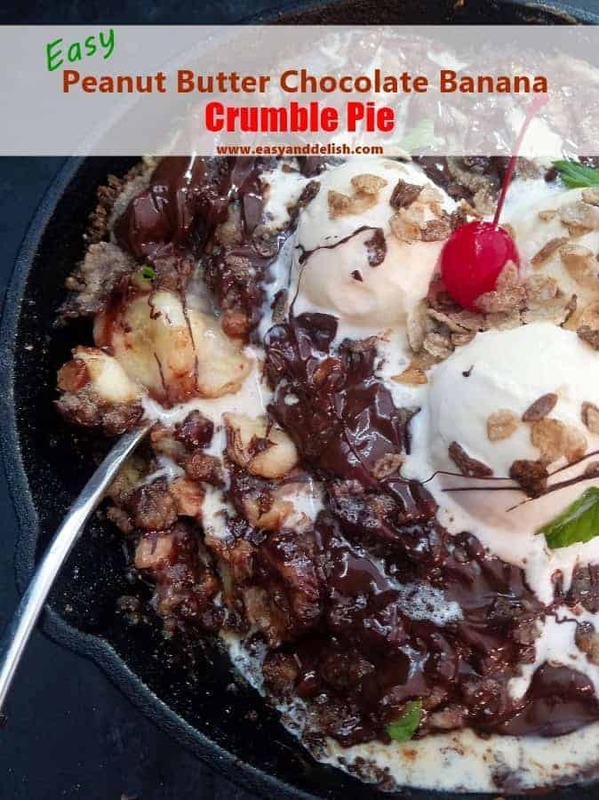 Peanut Butter Chocolate Banana Crumble Pie is a fun summer dessert easily prepared with 8 staple ingredients and served with ice cream. It’s a cereal lovers’ new favorite treat! Summer is fun… and anything that comes from the kitchen should be, too. I would say that easy and creative recipes are a must in order to be able to enjoy family and outdoor activities to the max, right? Our Peanut Butter Chocolate Crumble Pie totally fits the bill. 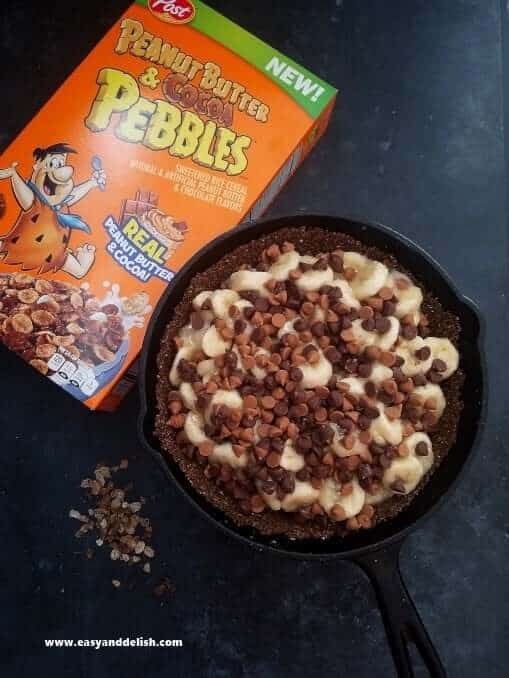 Made with Peanut Butter & Cocoa Pebbles™ Cereal, bananas, both peanut butter chips and chocolate chips, and a crumble topping, this pie is an one-of-a-kind dessert that tastes so good that only one slice is just not enough… and can feed a crowd. All ingredients are available at Walmart, providing one-trip shopping convenience. 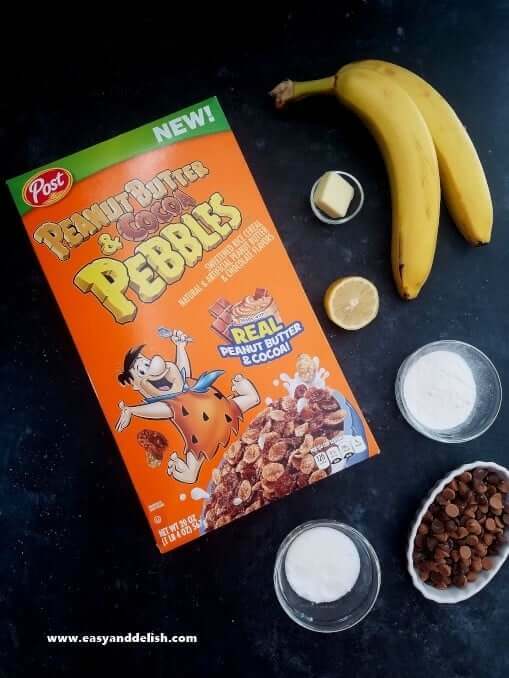 Peanut Butter & Cocoa Pebbles™ Cereal– which is a crispy rice cereal with the irresistible tastes of real peanut butter and real cocoa– features one of history’s greatest flavor combos: PB and chocolate! But right after making a trip to your Walmart, earn cash back with this Ibotta offer. Yep! Click on the badge below to learn more how to redeem this offer. Ready to prepare a new summer favorite? Well then, let’s go to the kitchen! 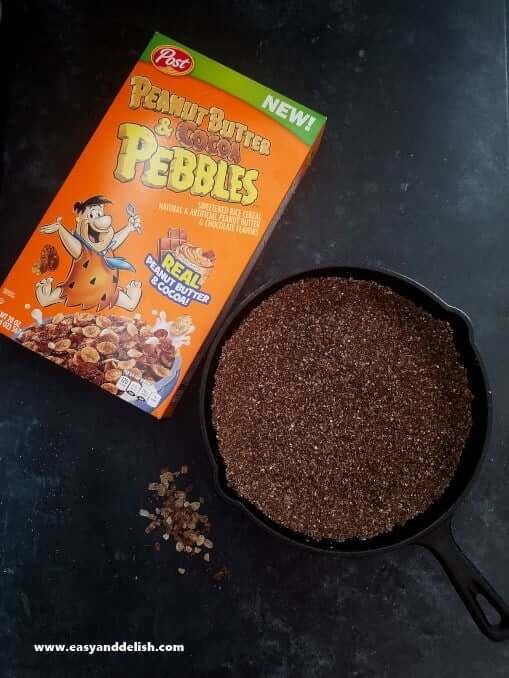 Pulse Peanut Butter & Cocoa Pebbles in a food process until finely ground. Or alternatively, place cereal in a large closed plastic bag and smash with a rolling pin or the back of a pan until finely ground. Mix 5 cups of the ground cereal with 1/4 cup sugar and 5 tablespoons of melted unsalted butter in a heatproof bowl and firmly press into the bottom and up the sides of a 10-inch cast iron skillet. Bake at 350 F fo about 8 minutes. Let cool completely on a wire rack before filling. Meanwhile, toss together sliced bananas, lemon juice, 1 cup sugar, and cornstarch in a large bowl. Add the peanut butter and chocolate chips, toss again, and place into the skillet in an even layer. Then, make the crumble topping by mixing 1/3 cup cereal crumbs with 1/2 cup flour, 1/4 cup sugar, and 8 tablespoons of cold butter in another bowl, mixing by hand until texture is coarsely clumpy and mixture will hold together in clumps when you squeeze it with your hand. Spread topping evenly on top of the banana filling with your hand and press it down lightly. Bake for 25-30 minutes or until the edges are bubbling and the crumble topping is lightly golden brown. 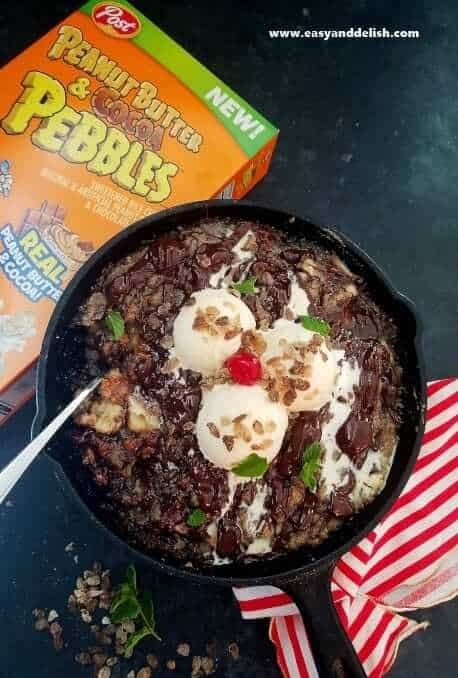 Serve slightly warm with vanilla ice cream sprinkled with Peanut Butter & Cocoa Pebbles. Peanut Butter Chocolate Banana Crumble Pie is a fun summer dessert easily prepared with 8 staple ingredients and served with ice cream. 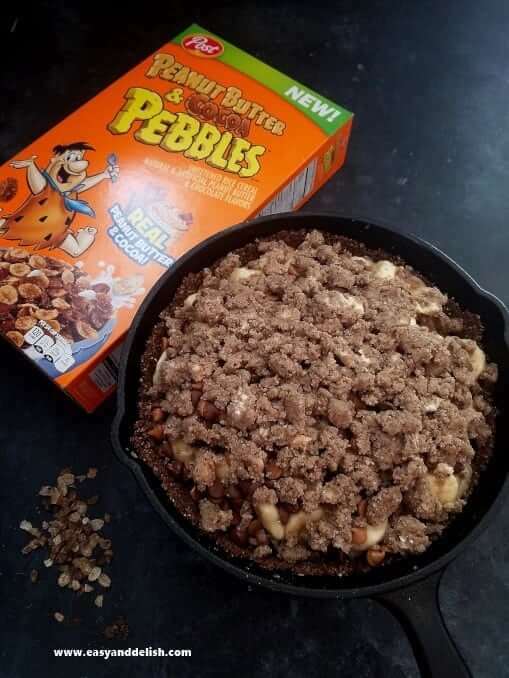 It's cereal eaters' new favorite treat! Pulse Peanut Butter & Cocoa Pebbles in a food processor until finely ground. Or alternatively, place cereal in a large closed plastic bag and smash with a rolling pin or the back of a pan until finely ground. Mix 5 cups of the ground cereal with 1/4 cup sugar and 5 TBSP melted unsalted butter in a heat proof bowl and firmly press into the bottom and up sides of a 10-inch cast iron skillet. Bake at 350 F for about 8 minutes. Let cool completely on a wire rack before filling. Then, make the crumble topping by mixing the remaining 1/3 cup cereal crumbs with 1/2 cup flour, 1/4 cup sugar, and 8 TBSP chilled chopped butter in another bowl, mixing by hand until texture is coarsely clumpy and mixture will hold together in clumps when you squeeze it with your hand. Any leftovers must be transferred to a clean airtight container and stored in the refrigerator for up to 2 days. 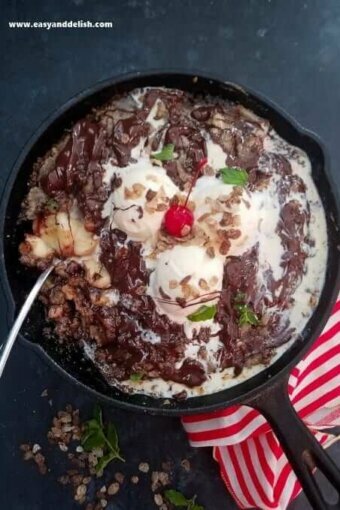 If desired, melt about 1/3 cup bittersweet chocolate chips according to the instructions on the package and drizzle over the top of the baked peanut chocolate banana crumble pie. Then, served topped with ice cream. What a fabulous way tp enjoy a bowl of cereal! Peanut butter, chocolate and bananas are such a winning combination of flavors. How long have these Pebbles been out? 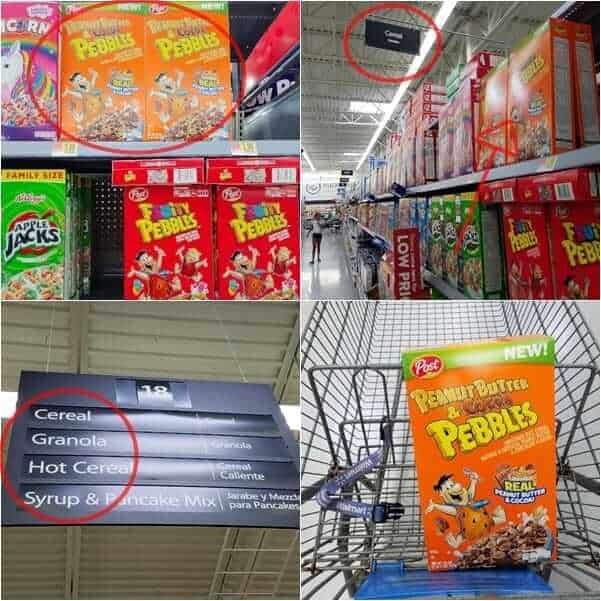 Maybe it is regional, because I bought some Fruity Pebbles a few weeks ago and didn’t see these. ! Tim, they are new although I don’t know exactly how long they have been out. It was the first time that I tried them and loved it as well as my family. I hope you get it soon. Thanks for stopping by.